Watermelon contains only 40 calories per cup. It is packed with vitamins and minerals. This fruit also contains anti-oxidants, phytochemicals, and electrolytes. Eating watermelon promotes hydration, reduces inflammation, and helps with glucose metabolism. The anti-oxidants in watermelon help reduce the oxidative stress on tissues. Anti-oxidants aid in healing cellular damage. They also support the immune system and lower inflammation. Reducing inflammation in the body helps heal and/or prevent many health conditions. 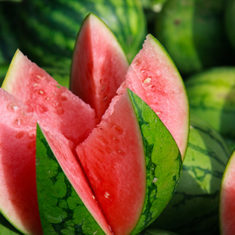 Watermelon may also help with glucose metabolism and insulin sensitivity. Both of these are important for Diabetes and weight management. And, the lycopene in watermelons affects insulin growth. Research is starting to show that this helps interrupt cancer cell growth.